Following the spine of the Appalachian Mountains, Interstate 81 provides a major trucking corridor and link from the Southeastern States and Tennessee Valley northward to the Northeastern Megalopolis. Interstate 81 does not enter major metropolitan areas; it instead serves an array of small to mid-size cities. The route commences from a rural directional T interchange near Dandridge, Tennessee to run northeast across agricultural areas and forest land along the west side of the Appalachian Mountains to the Tri-Cities region. A spur route, I-181, once connected I-81 with Kingsport and Johnson City. It was renumbered in 2003 as a northern extension of Interstate 26 from Asheville, North Carolina. Crossing into Virginia by the two-state city of Bristol, Interstate 81 combines with U.S. 58 to Abingdon. A short spur, I-381, links I-81 with the Bristol city center as the freeway bypasses the community to the north. Further east, Interstate 81 combines with Interstate 77 along a “wrong-way” overlap, where I-77 south combines with I-81 north and vice versa due to their east-west orientation between Wytheville and Fort Chiswell. I-77 leads north to Charleston, West Virginia and south to Charlotte, adding truck traffic from the Carolinas to Interstate 81 as it progresses northeast to Christiansburg, Roanoke and Lexington. I-581 represents the second urban spur for Interstate 81, as it combines with U.S. 220 south through Roanoke while the parent freeway stays north by Salem. Interstate 64 combines with I-81 from Lexington northeast to Staunton as part of its east-west route between Beckley, West Virginia and Roanoke, Virginia. Additional truck traffic funnels onto I-81 south from central Virginia via I-64. Northward from their overlap, I-81 continues to Harrisonburg, Strasburg and the west end of I-66, and Winchester to exit the state through the Eastern Panhandle West Virginia. The short stretch through the Mountaineer State takes I-81 through the urban area of Martinsburg. The section concludes at the Potomac River and Williamsport, Maryland. The freeway stays urban along the west side of Hagerstown between the crossroads with I-70 and Hagerstown Regional Airport (HGR). Truck traffic remains heavy as the route enters the Keystone State nearby. 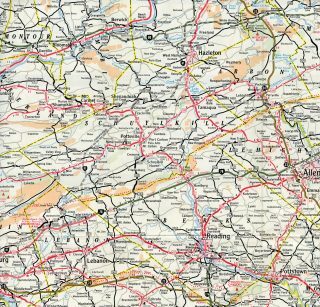 Angling northeast, Interstate 81 and its companion U.S. 11 pass through Chambersburg and Carlisle en route to the Harrisburg area. U.S. 11 provides the connection to Interstate 76 (Pennsylvania Turnpike) in lieu of direct access as I-81 turns more easterly toward the capital city. U.S. 11 meanwhile turns north along the Susquehanna River, leaving the freeway to follow U.S. 22 to Interstate 78 and an independent route northeast to Hazelton and Wilkes-Barre. U.S. 11 rejoins the I-81 corridor at Wilkes-Barre, following surface routes northeast to Scranton while I-81 hugs the east side of the urban area to Interstates 84 & 380 and the U.S. 6 freeway spur to Carbondale. West from there, I-81 passes between urban Scranton and Dickson City to briefly combine with U.S. 11 to the north end of Interstate 476 (Pennsylvania Turnpike – Northeast Extension). The remainder of Interstate 81 generally travels north-south along side U.S. 11 between Scranton and the Thousand Islands Bridge into Canada. An urban stretch takes I-81 through the city of Binghamton, where New York 17 / Interstate 86 overlap to the Prospect Mountain Construction Project, a long term rebuild of I-81 & 86 between NY 7 and their split over the west banks of the Chenango River. I-86 follows the Southern Tier of New York west to Elmira and Corning while I-81 joins Binghamton with Cortland and Syracuse. Through Syracuse, Interstate 81 passes through the city center while Interstate 481 provides a suburban bypass to the east. A long term project under study is the replacement of the aging viaduct around Downtown or the relocation of I-81 onto I-481 and subsequent conversion of the through route into a combination of urban boulevard and freeway spur. Beyond the city, I-81 travels a mostly rural course east of Lake Ontario to Watertown and the bridge system spanning the St. Lawrence Seaway to the Ontario 401 freeway. U.S. 11 parallels freeways for the majority of route from New Orleans north to Watertown, New York. I-81 runs along the US highway from east of Bristol, Virginia to Upstate New York, with the exception of between Harrisburg and Wilkes-Barre, Pennsylvania. Through Tennessee, U.S. 11 partitions into the branches of 11E and 11W, along the Interstate 81 corridor between Knoxville and Bristol. U.S. 22 also parallels the freeway from Harrisburg northeast to I-78 near Jonestown, Pennsylvania. Constructed in the 1950s and 60s, the 1.4 mile long elevated viaduct of Interstate 81 through Syracuse is deteriorating and in need of replacement. The substandard design also does not meet current Interstate standards. An environmental review process was initiated by the New York State Department of Transportation (NYSDOT) and Federal Highway Administration (FHWA). Preliminary engineering commenced in 2015 to evaluate various alternatives proposed for addressing future transportation needs along Interstate 81 and for the city of Syracuse. 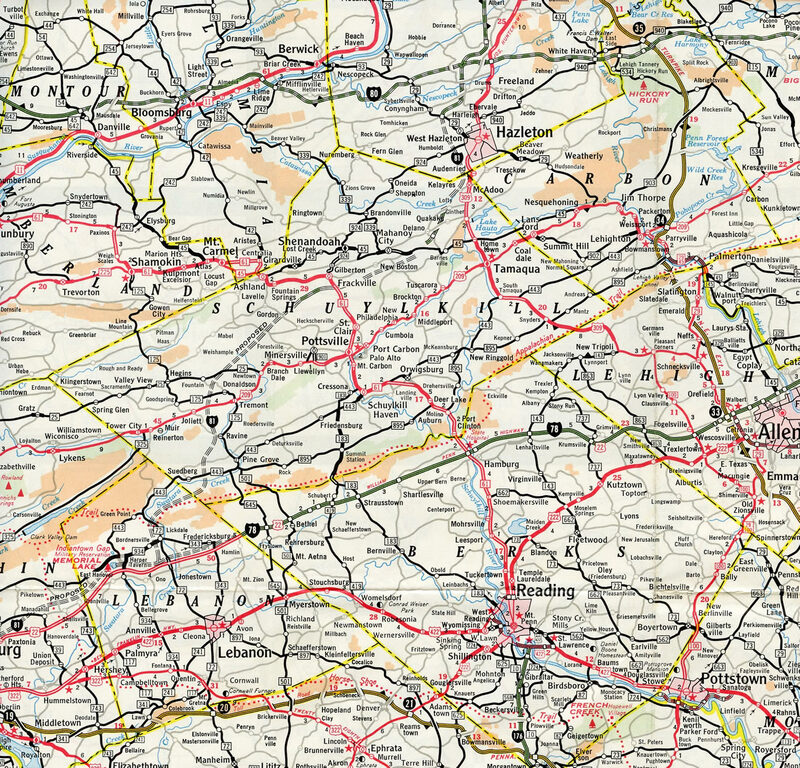 A branch route of Interstate 81 was designated from Scranton southeast to Pocono Township in northeastern Pennsylvania. Initially proposed as part of Interstate 82 by Pennsylvania on August 14, 1957, the route was renumbered by AASHO on June 27, 1958 as Interstate 81S.6 This later was renumbered again to Interstate 81E and ultimately to Interstate 380 as confirmed by AASHTO on June 20, 1972. Star Solutions Proposal. Expand Interstate 81 to eight overall lanes with a separation between car and truck lanes. This major overhaul was estimated to cost upwards of $10.9 billion and to be funded with truck tolls, which were legalized on trucks by the Virginia General Assembly in 2001. Fluor Virginia Proposal. Expand Interstate 81 to six lanes, with the implementation of car and truck tolls. Notably, car tolls were not legally permitted on existing Interstate highways in Virginia at the time. This concept entailed a $7 billion price tag. The major concern with the first option was that creator of the plan to expand the freeway to eight lanes, Star Solutions, included a request for a “noncompete” clause in its contract. 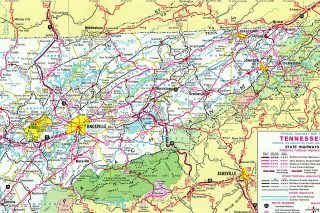 That meant that VDOT was disallowed from undertaking any new projects that would increase the capacity or overall improve any highways within the I-81 corridor for the 40-year life of the Interstate 81 bonds. This red tape would have impacted U.S. 11, U.S. 29 and Interstate 95 among other north-south routes in the state. With either option, construction was not expected to begin until at least 2007. However subsequent developments led to the cancellation of all proposals related to tolling Interstate 81. The southernmost 12 miles of Interstate 81 and the short stretch leading into Virginia were open to traffic by 1970. 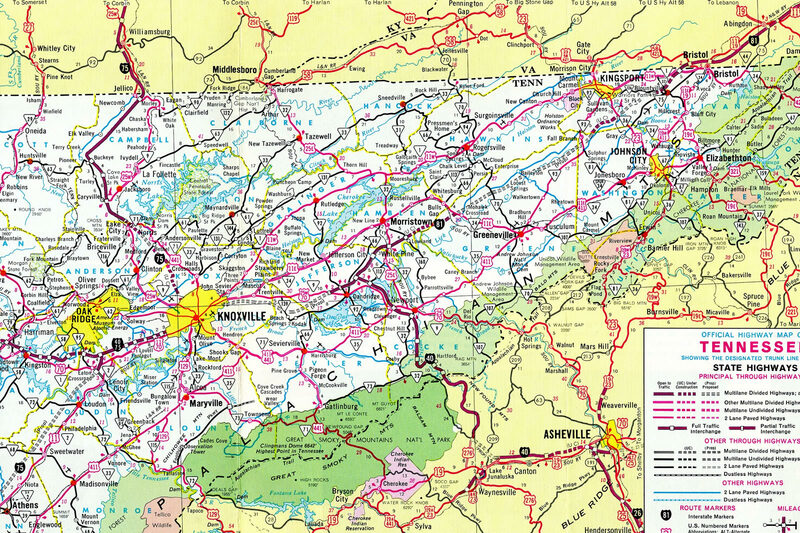 Per the 1973 Tennessee Official State Map, all of I-81 was under construction, with the route open northward to U.S. 11E near Mohawk Crossroad and southward to SSR 126 at Blountville. 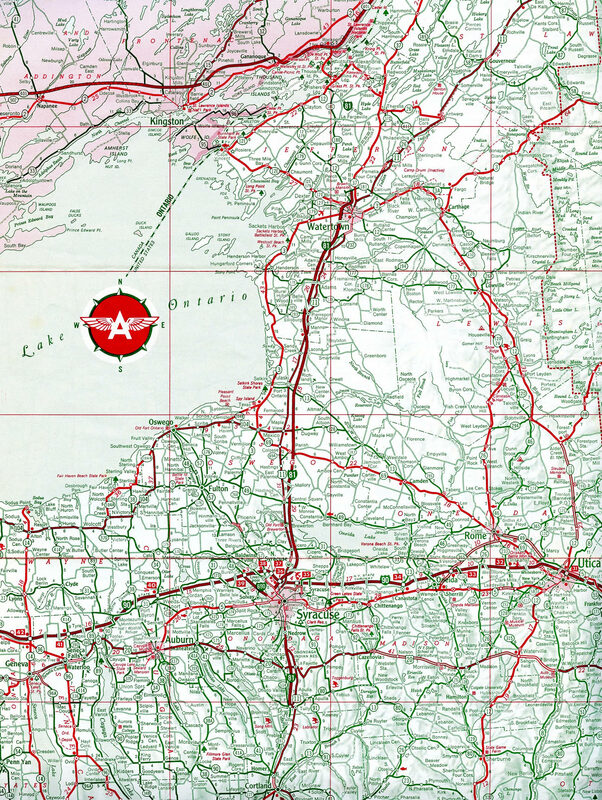 Segments of I-81 open by 1963 included the portion from Park Street and Onondaga Lake Parkway (NY 370) in Syracuse to New York 342 (former NY 181) north of Watertown and a bypass of U.S. 11 to the west of La Fayette. Additionally the Thousand Islands Bridge, dedicated on August 18, 1938, was incorporated as the I-81 connection to Ontario, Canada. Interstate 81 north reaches the last U.S. exit for Island Road (CR 191) and De Wolf Point just south of twin 90 foot arch bridges over the international rift boundary to Hill Island, Ontario.9 CR 191 connects the north end of I-81 with Wellesley Island and Dewolf Point State Parks as it leads southward along Lake of the Isles. Photo taken by Douglas Kerr (11/08/02). The first confirming marker for Interstate 81 south stands within the diamond interchange at Island Road (CR 191), just beyond the port of entry. Photo taken by Douglas Kerr (11/08/02). Interstate 81 expands to four lanes across Wellesley Island to a folded diamond interchange (Exit 51) with CR 100 (Island Road). Photo taken by Douglas Kerr (11/08/02). County Road 191 (Island Road) acts as an east side frontage road to I-81 from Exit 51 south to CR 100. Interstate 81 reduces to two lanes as it crosses the St. Lawrence River on the Thousand Islands Bridge in this scene. Photo taken by Douglas Kerr (11/08/02). The Thousand Islands International Bridge System travels 8.5 miles overall from Ivy Lea, Ontario to Collins Landing, New York.9 Tolls are collected in the southbound direction on the Canadian side of the border. Photo taken by Douglas Kerr (11/08/02). The 4,500 foot long span over the American channel of the St. Lawrence River crests at a height of 150 feet. Ground breaking for the two-lane suspension bridge took place on August 30, 1937. The span was completed ten weeks ahead of schedule in August 1938.9 Photo taken by Douglas Kerr (11/08/02). Approaching Ontario 137 (Exit 661) south on Ontario 401 (Macdonald-Cartier Freeway) east near the community of Selton. Interstate 81 spans the Raft Narrows (St. Lawrence River) along a combination of a 750-foot long suspension bridge from the mainland south to Georgina Island and a 600-foot Warren Truss span between Constance and Hill Islands.9 Photo taken by Jeff Morrison (06/27/07). An Interstate 81 trailblazer precedes the trumpet interchange (Exit 601) with Ontario 137 south to Hill Island on Ontario 401 east. Ontario 137 comprises a four-lane freeway south to Thousand Islands Parkway. Photo taken by Jeff Morrison (06/27/07). Replaced sign bridge for Ontario 401 (Macdonald-Cartier Freeway) east at Ontario 137 south (Exit 661). Ontario 401 constitutes a 515-mile limited access route between Windsor, near Detroit, Michigan, and Quebec near Cornwall, Ontario. Photo taken by Douglas Kerr (11/08/02). Entering the township of Leeds and the Thousand Islands, motorists along Ontario 401 (Macdonald-Cartier Freeway) west passed by the initial guide sign for Exit 661 and Ontario 137. Removed by 2009, a supplemental sign was added in its place referencing the Thousand Islands Bridge system to Interstate 81 south. Photo taken by Douglas Kerr (11/08/02). A new sign bridge was posted further east for Exit 661 on Ontario 401 Macdonald-Cartier Freeway by 2009. 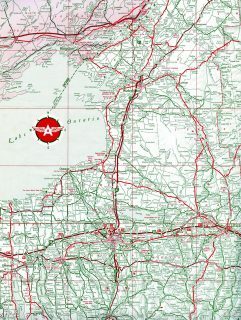 The Macdonald-Cartier Freeway continues west 30 kilometers to Kingston and 235 kilometers to Toronto. Ontario 137 travels two kilometers south to the Thousand Islands toll plaza. Photo taken by Douglas Kerr (11/08/02). Interstate 81 advances south two miles to Interstate 40 (Exits 1A/B) from a rest area near the community of Kansas. All guide signs for I-40 on I-81 south were replaced by 2013. Photo taken 06/25/12. Crossing Dry Branch, southbound travelers along Interstate 81 see a diagrammatic sign outlining the forthcoming directional T interchange (Exits 1A/B) with I-40. Photo taken 06/25/12. Two lanes default onto Exit 1B for the 30-mile drive along Interstate 40 west to Knoxville. A grade level directional ramp veers southward to merge onto the left-hand side of Interstate 40 east ahead of Douglas Lake and Newport. Photo taken 06/25/12. Interstate 40 crosses Douglas Lake ahead of SR 113. The freeway continues northwest two miles to meet Interstate 81. TDOT traffic counts along this stretch were recorded at 28,654 vehicles per day (vpd) in 2015. The advent of traffic from I-81 south swells the 2015 count to 67,475 vpd beyond Exit 421. Photo taken by Carter Buchanan (05/01/05). A diagrammatic sign replaced separate panels for Interstates 40 and 80 on the one mile approach to their directional interchange (Exit 421) by 2007. I-81 leads northeast to the Tri-Cities Region along a rural course to Bristol. Photo taken by Jim K. Georges (07/98). Exit 421 leads motorists 80 miles north to Bristol on the Virginia state line. Interstate 40 turns west and expands into a six lane freeway en route to Knoxville. Jeffrey Napier (01/02). Late 1990s construction along Interstate 40 widened the freeway to six lanes with a barrier median to the split with Interstate 81 north (Exit 421). Like I-81 south, drivers along I-40 east see a rest area preceding their exchange. Photo taken by Jeffrey Napier (01/02). Interstate 40 eastbound expands to four lanes to the left-hand ramp (Exit 421) with Interstate 81 north. The freeway turns southward from the upcoming junction along a winding and scenic route across the Bald and Great Smoky Mountains. Photo taken by Jeffrey Napier (01/02). Passing over Koontz Creek and Valley Home Road (SR 66), Interstate 40 continues to within a half mile of Exit 421 with I-81 north. I-81 north to I-26 south provides an alternate route to North Carolina in case of emergency closures along Interstate 40 through Pigeon River Gorge due to rock slides or inclement weather. Photo taken by Jeffrey Napier (01/02). Two thirds of the traffic along Interstate 40 east shifts to I-81 north toward the Tri-Cities and southwest Virginia. I-40 heads south and then east on the 80-mile drive to Asheville, North Carolina. Photo taken by Jeffrey Napier (01/02). Prior to the late 1990s expansion of Interstate 40 eastbound from two to three lanes, this set of guide signs directed motorists for the upcoming split with Interstate 81 north. Photo taken 05/29/95. Replaced by 1998, nondescript guide signs previously directed motorists one-half mile ahead of the Interstates 40 east and 81 northbound split. Vidcap taken 05/29/95. Overheads at the Exit 421 separation indicated just one through lane for I-40 east to Asheville and I-81 north to Bristol. Vidcap taken 05/29/95. “VDOT criticizes 2 consortiums’s plans to widen I-81.” Roanoke Times, November 15, 2003. Interstate 81 in Virginia (RoadstotheFuture). Interstate 81 in New York @ Wikipedia.org. “Research panel predicts state road fund shortage.” Charleston Gazette (WV), June 22, 2006. “Rethinking I-81: Eastern suburbs could see new highway names, interchanges, lanes.” The Post-Standard (Syracuse, NY), November 16, 2016. 75th Anniversary Fact Sheet, Thousand Islands Bridge Authority.